Northern Power Distribution Company of Telangana Limited Company has been issued the Junior Lineman Vacancies. Willing Aspirants have to apply At tsnpdcl.cgg.gov.in for TS NPDCL 2553 Junior Lineman Posts. The TSNPDCL JLM Recruitment Online application is started from 21st Feb 2018. Complete the TSNPDCL JLM Online Application form before 19th March 2018. Almost the Officials are in the process of releasing the Date Of TS NPDCL JLM Online application link. They will open the Link on their official main web portal @tsnpdcl.cgg.gov.in. Here we present you the lot of details of Northern Power Distribution Company of Telangana Limited Organisation, which is one of the most Electricity Distribution company it supplies the Power to nearby the Districts of Kamareddy, Peddapalli, Jagtial, Mancherial, Nirmal, Kumram Bheem, Rajanna Sircilla, Warangal Urban, Warangal Rural, Mahabubabad, Prof Jayashankar, Jangaon, Bhadradri Kothagudem, Adilabad, Nizamabad, Karimnagar and Khammam. It gives the employment in Annually. The main aim is to promote the Well Being Candidates in this Most Prestigious Organisation. So, who had the Eligibility they should use this enlistment. Must have the Qualification In SSLC/SSC/10th class with I.T.I qualifications in Electrical Trade/Wireman or 2 years Intermediate Vocational course in Electrical Trade. Qualified Candidates have to get the Basic Salary of Rs. 15, 585/ – Rs. 25, 200/- including all allowances. Apply 2, 553 TS NPDCL JLM Vacancies @ tsnpdcl.cgg.gov.in: As per the Officials said, The Applicants have the minimum qualification in their academics & must score the minimum qualifying marks. The Applicants have the Eligibility in order to apply this TS NPDCL JLM Recruitment 2018 have the eligibility 10th class with I.T.I qualifications in Electrical Trade/Wireman or 2 years Intermediate Vocational course in Electrical Trade, The candidates who have this qualification they only participate in this Recruitment Process, if not you just check out some other Jobs In Telangana State only. Based on the Eligibility we update the Employment news. As per the TS NPDCL JLM Official Notification, we intimate for the Waiting Aspirants, The Registration is open from 22nd Feb 2018. So, From that day onwards the Interested one’s can upload the details within the duration of the closing date of registration which is on 19th March 2018. After complete the registration you just focus on the Exam Syllabus In Pdf format. The Junior Linemen Exam date is on 08th April 2018. So, you would also check out the Admit card of TS NPDCL JLM Exam. The Direct link will valid from 02nd April 2018. If you arise any doubt contact to the Officials. Or you may leave a comment in the below of this article. We all give you the clarification. 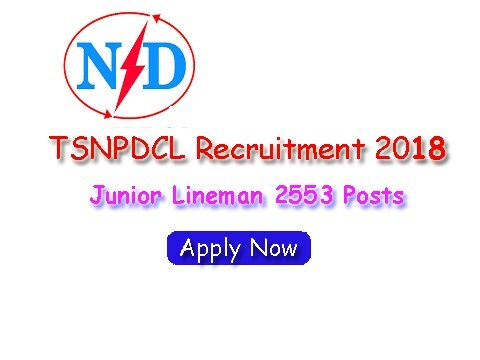 Official Notification Of TSNPDCL JLM Recruitment 2018 Notification>>>Download Now!!! Intermediate students with mpc background are eligible for this job are not. As per the notification, it is clearly saying 10th + ITI or Vocational course is eligible for the Post. Please read the notification before you act. Sir, I am get in 27 marks qualify yes/no.